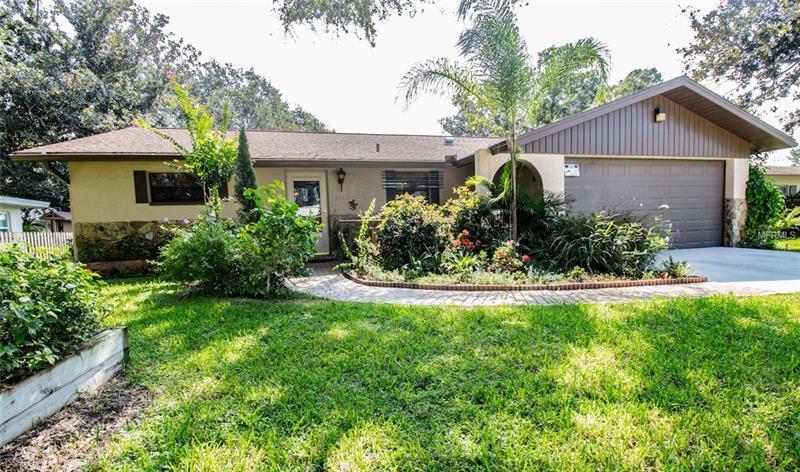 This is a great ranch style home with nice lake view in it's back yard! It has a "feel at home" impression and features 3 bedrooms, 2 bathrooms, large eat-in kitchen with lots of cabinets and counters, plus a newly replaced dishwasher that's only few months new. Additional features include a generous sized living room and a family room in the back of the house overlooking the gorgeous huge back yard with the lake view. Other highlights include a split bedroom plan, 6 panel interior doors, large main bathroom off the hallway with tub and money saver ultra flow high rise toilet. Master bathroom features rap-around-shower and ultra flow high rise toilet. The over-sized two gar garage with newer garage door opener contains work benches and shelves built by the seller that will be generously given for free to the new owners. Additional future includes a whole house surge protection. Also in the back yard there's an orchid house with many different orchids, and other beautiful/interesting plants that the sellers are willing to leave for the new owners. This home is a true gem and is awaiting new loving owners, and had only two owners. Conveniently located to any major roads highways, and airports, shopping, restaurants, e.t.c.